Uh-oh. I knew what she was talking about. I constantly hound my kids to clean up after themselves and I forget to cover my tracks when I make a mess in their rooms. I had done a photo shoot for my blog and left Barbies all over my daughter’s floor. I do it all the time. I set up a scene, take some shots, and then download them to see if I got what I wanted. I don’t clean up until I know I’m done. Most of the time, I forget. 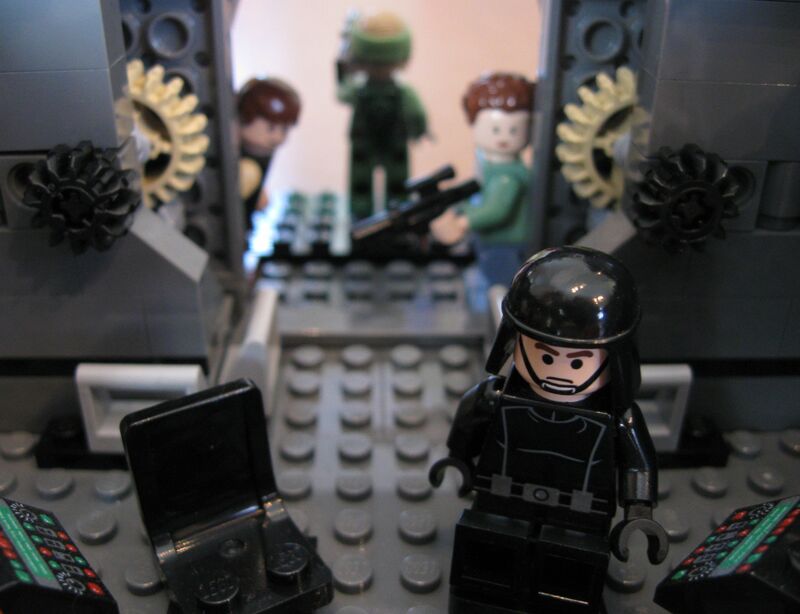 I’ve left Lego Star Wars scenes out, dolls, robots. The kids must think I secretly play with their toys when they’re at school. I left this scene out, but my son thought it was great. He didn’t ask many questions. The kids know I have a blog and that I write about them. I don’t think they really know what that means, that anyone in the world can read it. I’ve explained it to my son without going into much detail. Though I think he and a friend once found the post I wrote on our laptop about the boys’ bathroom, and that must have been quite confusing. “Dude, why is your mom writing about the bathroom at school? Was she there?” “I don’t know, man. Totally weird.” I told him I write about being a mom and that sometimes I write about specific things, like how we read stories together at night or how he went on an overnight trip and it made me sad. He seems OK with that. Anyone who has followed my blog for a while knows I don’t post pictures of my kids or share their names. It’s a challenge to write a mom blog and not do those things, but I knew from the start that I just couldn’t. My blog is actually about me, being a mom. It’s not about my kids or my husband. It’s about how I react to and handle what goes on in my family. I figure my audience can picture a couple of cute kids. So I take pictures of toys and props to go with my posts, and sometimes I get caught. Barbie’s evil plan is in the works. My daughter thought I was nuts. I’d love to show off my kids. They’re great. But the Internet can be a dangerous place for them. Every time I check my stats, I’m sickened by the searches that brought people to my site overnight: people looking for things that shouldn’t be done with six-year-olds, people looking for things that I don’t want even pictures of my kids to be associated with. There’s a fine line to blogging, what I can and can’t write about. I try to keep my kids’ feelings in mind as I write about them. I try to choose moments that are relatable to others, things all kids do. Sometimes things happen in my family that are just too personal. I wouldn’t want my child to read it later and be crushed or embarrassed or to feel betrayed. I wouldn’t want a parent she knows to know her secrets. And I know I’ll still have a lot to be accountable for—for what I have shared, why I have more posts of one child than the other—when the kids are old enough to read my blog. But I hope my kids know that I’m trying to share this time through my eyes. Maybe they’ll realize that I do try every day with them, that every decision is hard. They’ll understand why I yelled or melted down or made them go to bed at 8 every night. Maybe they’ll see one day that this parenting thing is much harder than it looks. Hopefully they’ll see in every post that I love them. One year ago today I published my first blog post (it took me about a year after I thought of starting a blog!). I take my time thinking things through, what can I say? One thing I didn’t have to think long about was thanking my readers for being loyal, for commenting, for liking, and for coming back. If you have a blog, you know how scary it is to write that first post. You know how exciting it is to get your first subscriber, your first comment, and to suddenly start feeling like you have a sense of community. I had no idea what I was getting into when I started blogging, but I wanted to write all the thoughts that flow through my head as I shower each day or drive down the road. I had put writing on the back burner for a long time to deal with two young kids who always needed a snack, something from the top shelf, or something wiped. I desperately wanted to write again and for some reason, I wanted to do it publicly. I think I thought blogging would force me to write every week and work at it. It has, and it has never felt like work. I’ve pushed myself in ways I didn’t think I would. I’ve been inspired by other bloggers I’ve met along the way. I’m thrilled to have all of you here. I just wanted to stop between posts and say thanks for reading every week. Thanks for giving me an audience. I know some of my subscribers aren’t getting my posts through the WordPress reader and I have been posting regularly. I don’t know how many people this affects. If you are having trouble, I don’t know if it may help to unfollow and then follow me again, but make sure you are logged in to WordPress if you do so. As far as I know, everyone is still getting emails of my posts, right? Let me know if you’re having trouble or if you continue to have trouble. I’m trying to work with WordPress to get it cleared up. And if anyone has any tips or has been through this, please let me know. I know WordPress has been experiencing issues with its reader, but I switched names at the same time. I’m now mominthemuddle.com. So far I don’t have many answers. 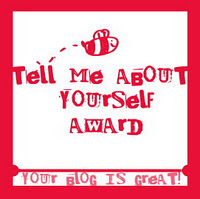 So it looks like I’ve been given a blogging award by Mommy Said a Swear Word. It’s kind of a cool feeling to be honored for something that I put quite a bit of effort into. I mean, I think about it often. I spend time with it. I nurture it. I’ve watched it grow. And for my hard work and loyalty—and so soon after my blog’s birth—I have this lovely badge of honor to proudly display. Someone likes what I do. They appreciate me. I don’t know what to say. Just, thank you. It is mind-blowing, this praise thing. There has to be a way to get our kids into this award business. It would be pretty cool if, say, instead of during a quiet meal that I think my son enjoys, he didn’t lean over to me and whisper, “This is disgusting.” I’d much rather be presented with a ribbon or a trophy or hear, “Thanks, Mom, for a warm meal every night.” But, hey, that’s just me maybe? So to proceed with the acceptance of this award, I must reveal seven secrets about myself. Since I am quite the boring mom, really, and have no secrets that I can think of (or can remember anyway), I’ll tell you seven things about me that you may or may not want to know. 1) I am terrified of heights. In movies where a character is faced with a scene on a ledge or something equally horrific, my palms sweat, I go weak and panic. I’m having trouble typing this just thinking about it. 2) My job as a reporter many years ago allowed me to do some really cool things and meet some awesome people. I flew in a four-seater airplane (couldn’t look down!) and then wondered the whole time why on earth I agreed to it. 3) I can touch my elbow with my tongue. 4) If my house caught on fire, I’d try to grab my recipe box (after my kids, of course). It is a large antique recipe box that I have put a lot of time into and all of those recipes are delicious. But I wouldn’t ask my kids for their opinion on that. 5) I do not like Elvis music. I never have. Never will. 6) I do, however, love old things. I collect jadeite dishes and vintage kitchen items, Art Deco pictures, and other odds and ends from the 1920s through ‘50s. They just don’t make stuff like they used to. Now I have to list blogs I enjoy. I am just getting the hang of all of this to start actually following other people regularly, but here are a few that have caught my eye so far, a smorgasbord of fun spaces. I may have left someone out (blogroll to come soon). But really, go check these out.